Launched at Rs. 7.35 lakh Mahindra’s new compact SUV, the NuvoSport, has been put on sale in the country. Priced between Rs 7.42 lakh and Rs 9.87 lakh (ex-showroom, Delhi), the newcomer replaces the aging Quanto. That means it’s a sub-4m compact SUV that is ready to take on the likes of the Ford EcoSport and Maruti Suzuki Vitara Brezza in the market. But then, Mahindra already has the TUV300 competing against these models. And as a result, directly or indirectly, both the Mahindra stablemates will be fighting against each other as well. On the whole, the NuvoSport retains the profile of the outgoing Quanto albeit it looks more aggressive than ever before. The front end has been completely revamped, ditching the old car’s bland and conservative design for a beefy look. It’s highlighted by a sleek pair of headlamps with eyebrow-like LED DRLs. The bonnet has a prominent power-dome. Around the side and rear, the NuvoSport retains the profile of the Quanto, although it gets a good dose of black with blacked out pillars and tail-lamps. Under the skin, the NuvoSport ditches Quanto’s chassis for the company’s third generation ladder frame chassis. The same architecture also underpins the TUV300 and Scorpio. So what’s the point of having another compact SUV based on the exact same architecture? Well, Mahindra says that the TUV300 is a more rugged SUV while the NuvoSport is a modern and urban SUV. And so, whichever catches your fancy you’ve to decide for yourself. The Vitara Brezza and EcoSport in comparison look smaller and less intimidating than the Mahindra duo. The EcoSport, however, pretends to look like an SUV with its puffed up appearance, whereas the Brezza is the most conservative design of all. Inside, the dashboard design and layout of the NuvoSport is largely unchanged from the Quanto. Feature wise, it has height adjustable driver’s seat, reclining second row, cruise control, electrically adjustable mirrors, engine start/stop system, steering mounted controls, etc. Top-end variant also gets a 6.2-inch touchscreen infotainment screen. The TUV300 is similarly equipped although it misses out on cruise control, reclining second row and touchscreen infotainment system. Compared to the Mahindras, the other two rivals are much better equipped since they come with a lot of additional kit, especially the Vitara Brezza. 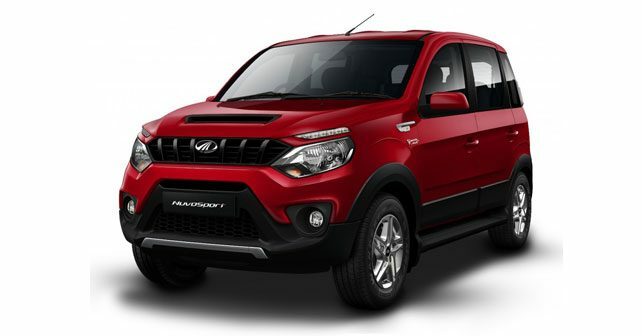 Powering the Mahindra NuvoSport is a 1.5 litre, three-cylinder turbo diesel engine developing 100bhp of max power and 240Nm of peak torque. The engine is badged as the mHawk100 although it’s a heavily revised version of the Quanto’s unit. It comes mated to a five-speed manual gearbox as standard while AMT is optional in two variants. It also comes with two switchable driving modes – Eco and Power. The TUV300 uses the same drivetrain, although its engine delivers lower power and torque figures – 84bhp and 230Nm. The Vitara Brezza comes powered by a 1.3-litre four-cylinder diesel engine developing 88bhp and 200Nm, paired to a 5-speed manual gearbox. The EcoSport is the only one offered with petrol as well as diesel engine options here. It has two petrol – 1.0 EcoBoost and 1.5-litre, and a 1.5-litre four-cylinder diesel unit on offer. The diesel engine is rated at 99bhp and 205Nm and comes mated to a 5-speed manual gearbox. The NuvoSport has an ARAI rated fuel efficiency of 17.45 km/l, which is the lowest here. The TUV300 is slightly less thirsty at 18.49km/l, followed by the EcoSport diesel at 22.27km/l. The Vitara Brezza is the most efficient returning 24.3km/l. The NuvoSport comes with dual-airbags and ABS with EBD fitted on all the variants except for the base N4. The TUV300’s top-end variant comes with dual-airbags and ABS while these are also optional on lower variants, starting from base. Maruti Suzuki offers driver airbag as standard in the Vitara Brezza while a passenger airbag, ABS and EBD, are offered as optional from the base variant onwards. But if it’s safety that you’re after, the Ford EcoSport trumps all in that regard with 6 airbags and ABS and EBD on its top-spec variant. It, however, does not come with airbags or ABS as standard, neither are these offered as optional extras on the base variant.